Yesterday, I showed you the Lizardine real metal thread as it’s being used on the Floral Glove project from Thistle Threads. Today, I thought I’d show you Lizardine up close! In the photo above, you can see that the Lizardine is un-stretched on the left, and stretched out on the right. This is to give you a sense of how it can be used. Notice that it’s pretty much like a smooth tube in its un-stretched state, and more like a spring when stretched out. As I mentioned yesterday (I think! ), if you stretch the Lizardine, it doesn’t spring back. It’s a very stiff real metal thread. Keep in mind, too, that the photo above is taken on macro mode, so it is a close-up photo. The fabric it’s sitting on, to give you a sense of size, is a dower quality linen with about 50 threads per inch (so, a fairly high count linen). That little bit of un-stretched Lizardine is about 1/8″ long – so it is a tiny, fine real metal thread. When they’re put right next to each other, you can see the obvious difference between Lizardine and Pearl Purl. 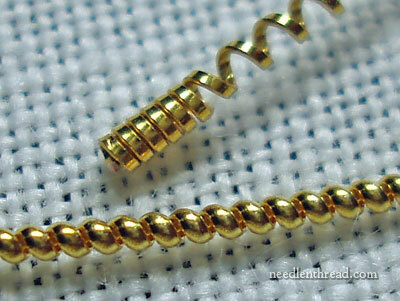 The coils on Pearl Purl are rounded, giving the effect of a string of tiny golden beads when the thread is un-stretched. Lizardine, on the other hand, is flat. Both threads are beautiful, don’t you think? I like them. I especially like them used in combination, like they are on the roundel in yesterday’s post on Silk and Gold and Lizardine. You can find Lizardine in shops that carry goldwork threads imported through Access Commodities. So, whatdyareckon? Is Lizardine a metal thread you’d add to your list of things to try?! Let me know your thoughts! Whatdyareckon? Picking up a bit of Aussie there Mary. Goodonya! Well, I reckon that, yes, they do complement each other, especially the way you have them placed. Individually though, I much prefer the flatness of the Lizardine to the roundness of the Pearl Purl. For my taste it has less of a pretentiousness about it. I feel I wouldn’t hesitate to use Lizardine, where as the Pearl Purl..well, maybe it has more shine surfaces to it and that doesn’t appeal to me as much. All this is very, very interesting though. I like to know what things are and what they’re for even if I don’t use them myself. I have never seen both the threads but I do hope to look for them soon. Your post today has show me one more thread to hanker for. Oh Mary! I guess I will have to take out a 2nd loan on the house. The threads are so beautiful! Or my husband has to get a 2nd job. I will look for those metal threads. I would use the Lizardine metal thread I think it adds to the total group of metal threads. Hi Mary. Tanya Berlin of Berlin Embroidey just ordered some for me, and I believe she is going to carry it now. She lists it as lizerine, but it is the same thing. And The Essamplaire and Traditional Stitches also have it on their websites. Thanks for the close-up looks at these threads, Mary! In reviewing yesterday’s post with the comparison photos, I’m really fascinated by the similarities and differences in the pearl purl and the lizardine. It just depeends on the effect that you want. It seems to me the lizardine adds gold sparkle to your red silk and the silk adds a red sparkle to your purl. As Kath mentioned, the purl has more gold surface, which makes the silk the accent. I’m sure that more or less stretch of the metal thread could change the appearance some, but the look would still be very distictive. I like them both and they look great in combination on your glove! 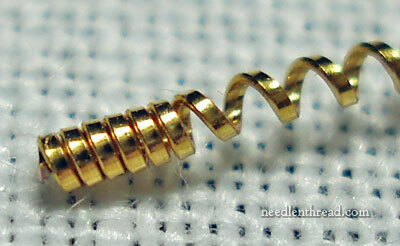 Because I do quite a bit of Goldwork, yes I would use Lizardine as well as Purl purl. It would add another dimension to any work it was used in, & there is room for adding coloured thread between the coils. Mary I sometimes despair. I look at your “Sneak Previews” and then look at what I’m working on and think, ‘Oh my God that girl is Brilliant.’ If this is a sneak preview I can’t wait to see the finished product. As for Lizardine and Pearl Purl, you’ve won me. They really are quite lovely. Thanks for the heads up on where to get them. Thanks for this info, Mary. My only daughter is getting married next year and I have been looking for ‘relatively’ simple projects that I hope will become family heirlooms. I will definitely try this on one of those. Can I buy these threads on line as I don’t have access to many specialty needlework shops? Any suggestions for wedding projects would be gratefully received. I love your work and am overcome with admiration!! Next Next post: Thread Drop Winner!